When you have a car with a beautiful or even distinctive engine note, it’s nice to have a convertible so you don’t have to rely on tunnels and barrier walls to hear it. Of course, not every car with a great engine is available as a convertible, but the Corvair is one of those. And whichever second-generation Corvair you get, you’re guaranteed to have a head-turning car. 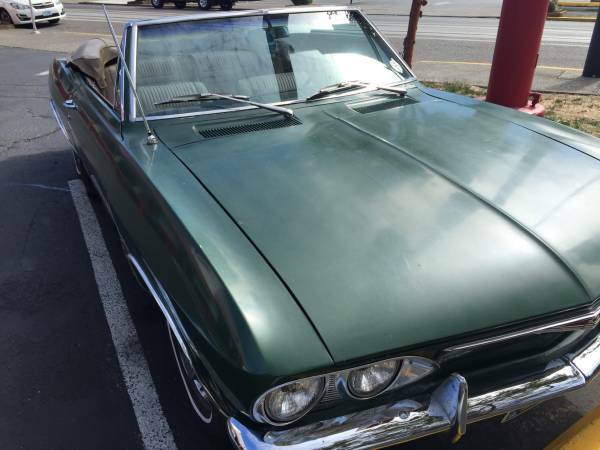 Check out this 1965 Chevrolet Corvair Corsa Convertible for sale for $2500 in Portland, OR. 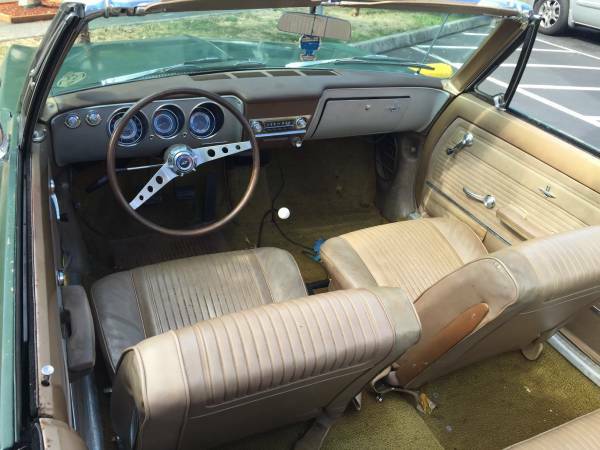 Decent running, driving Corvair convertibles don’t usually dip this low in price, so it’s a mystery as to why it’s lingered on the market for so long. The seller does concede it’s not the best time to sell a convertible, and there is some rust around the windshield, in the trunk, on a door, and on a wheel well, due to its Minnesota origins. There is said to be some rust in “tricky spots”, but floor boards and most body panels are said to be okay. But with only 88,000 indicated miles, it’s spent most of its life as a summer fun car, and though the repaint is not in the original gold color, it still suits the car well. The interior could probably stand to have a thorough cleaning, but seems complete and intact. That skinny wand shifter gives away the 4 speed manual, and while the dash layout is functional on the verge of blandness, the simple, uncluttered design is refreshing compared to your average modern car. The car has not failed the seller in several years of summer driving, so hopefully that means they kept on top of maintenance. As an aside, what is the point of an air freshener in a convertible? Does the seller drive down the street and shout “You’re welcome for the fresh air!” to passing pedestrians? The 140 engine was rebuilt before replacing the original 110, but no mention is made of when this happened. It’s said to have a noisy valve – does this mean a valve adjustment or something more serious? Either way, the power upgrade is nice, and while 140hp is gross, you can figure you’re getting about 100 net – no drag racing, but enough to pull this little car around. 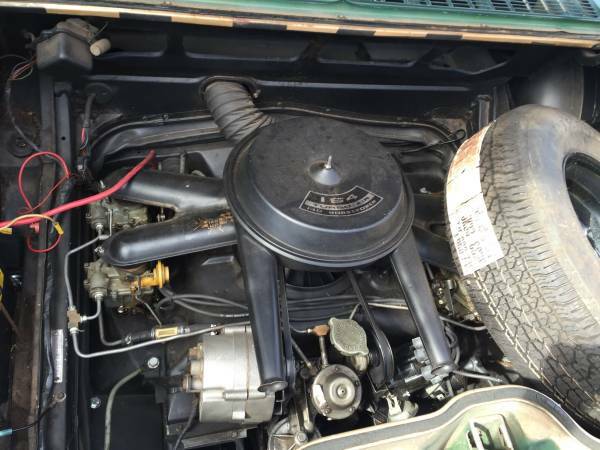 Corvair owners, what would you look out for here? This entry was posted on October 19, 2015 at 5:39 pm and is filed under Feature. You can follow any responses to this entry through the RSS 2.0 feed. You can leave a response, or trackback from your own site. I don’t think that’s a Corsa dash, so either it’s been replaced or it’s a mislabeled Monza. Still, it’s a manual convertible, so it’s worth a look. Well, the answer to your comment about the “bland” dashboard is because this car doesn’t appear to be a Corsa, a point reinforced by the further info that it originally had a 110 hp engine. All ’66 Corsas came stander with the 140-4 carb setup with the 180 hp Turbo available as an upgrade. Actually, the 140 was available throughout the Corvair lineup (optional) but was standard in the Corsa and interestingly could be teamed with Powerglide in the Monza & 500 but not in the Corsa. Google “Corvair Corsa Dash” and you’ll see that they had 4 additional smaller round gauges (clock, head temp, manifold pressure, oil press, IIRC) in the center between speedo & tach. Also look at Old Car Brochures. Also, another hint that this is not a Corsa is that there is no Corsa badge ahead of the rear wheel opening, though that could have gone missing during the repaint. And, anyone who’s ever had a convertible with semi-leaky floors and a semi-leaky top can attest that during top-up travel an air freshener is a real plus. Agreed — it is not a Corsa dash, and the fact that it is stated that a 110 hp engine was original also says it is not a Corsa. But nothing wrong with a nice Monza. And the 140 is one of the two engines that was available in the Corsa. Looks like Austin, Willy and I fell for the same mistake. It’s RBT that calls it a Corsa, not the seller. Just looked at his CL ad again, and nowhere does he call it a Corsa. He just made mention that he had installed a 140 engine and apparently from that info, RBT felt it appropriate to add the Corsa moniker. Just like BaT does, injecting hype into the posts that the seller never made. Sadly, it’s nothing that fancy… your writer just fell for the allure of alliteration and the 140hp engine. Now fixed… thanks for keeping me honest.